This curatorial project by VisualContainer is aimed at telling the most interesting trends of videoart and thus providing spots over the videoart research currently being practised in Italy and beyond, so as to prompt fruitful analysis and enjoyment. This curatorial project by VisualContainer is aimed at telling the most interesting trends of videoart and thus providing spots over the videoart research currently being practised in Italy and beyond, so as to prompt fruitful analysis and enjoyment. Three visions spots, i.e. three recurring themes in the latest video production are proposed. The first is relevant to interpersonal relationships: an investigation that seems to be more and more prominent in the social and existential uncertainty of our contemporary world and that connects with ever increasing ambiental urgencies. There we assist to a new look over the environment and relevant characters around us, under the wish to keep on at the real and get closer to everybody inhabiting it, trying to enlace new and positive interactions. Tangential to this, brand new forms of narration are being developed: an almost unrepresented trend in the videoart history – as something traditionally contrasting any easy reading according to a beginning and an end – narration has become a more and more frequent device in the latest videoart offerings. A growing hybridation of videoart with the fictional forms of movie, as well as on-line autobiographical videosharing, has in fact created a new visual content that, without relinquishing typical contemporary art features, undoubtely presents a more narrative style, a more coversational pattern: eventually, an art hybrid that is possibly at the start of a new evolution and that could largely benefit from any progression of the audiovisual technology to provide unexpected sceneries of or away from the real. The third trend that has been recognized and hence proposed in the project is the performance by the artist and/or collaborators, introducing to a new aesthetical and poetical realm played by most revealing gestures and body language. Many of the most recent videoart projects often show the mise-en-scène of new semantic codes provided by and to the sight, touch, movement and gestures. Everything being mimed and played on the screen can allow us to face the vibrations of the real world in the past or present time, thus entering the very core of life and then directly perform in person with enpowered communicative and social skills. in S. Claessens and L. Eglème, each piece of violin made without knowing what would come out from the other. Both selections were then simply juxtaposed just to make a bet and the two videos put side by side. The purpose was to make video and sound working by pulling invisible wires, the ones from thoughts, balance and fragility. The thoughts, the link between the thoughts of a male musician and a female musician working at a distance without comparing on the project. The precarious balance, which changes every frame between two video sequences played live. 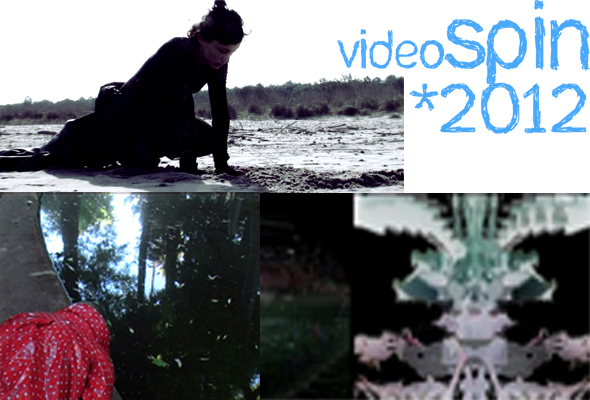 The fragility, the risk of resulting from the juxtaposition of these four works (two video tracks, two audio tracks). Man & Woman also implies the energy of complicity, the complexity of “living with” that is often replaced by “living for.” The energy deployed and shared in our relationships with the other, is also in the creative proposal, if we consider that Art is humanity. In a botanic garden under ruin, the wind is rippling a sheet of water beside which a lifeless character can be spotted. Like a doll thrown on to the floor, she is just connected with the black pool nearby. Sifr is dedicated to the sport of racing and offers a personal reflection over the way we can reach a spiritual evolution through the body and physical hard training. Such a distance, like the metaphor of a spiritual journey, becomes and ever-lasting running. In front of her, there hangs a seven-rug ladder that simbolically joins earth and sky together.